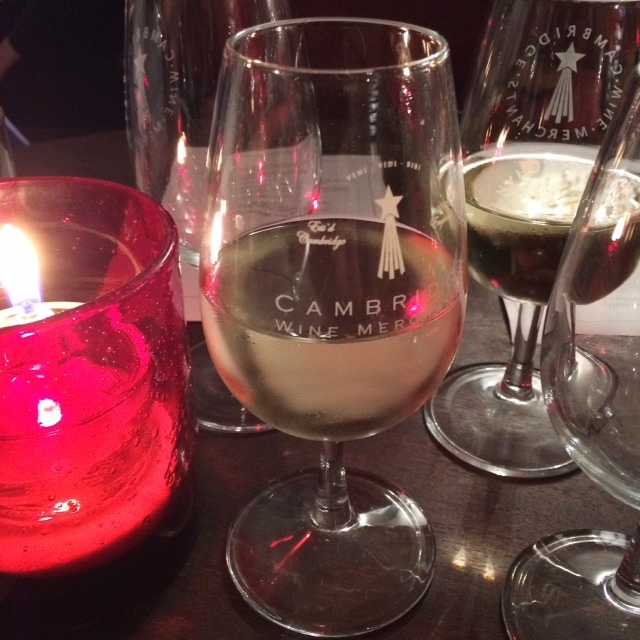 I’ve been following the events of Qué Rico Tapas for quite a while so I was delighted when I got my ticket to the latest tapas and wine tasting at Cambridge Wine Merchants. Estefanía Led Ramos of Qué Rico Tapas is a talented, self-taught cook full of originality and passion. This collaboration of matching regional dishes with Spanish wines from Castilla-León brought out Estefanía’s wonderful creativity. 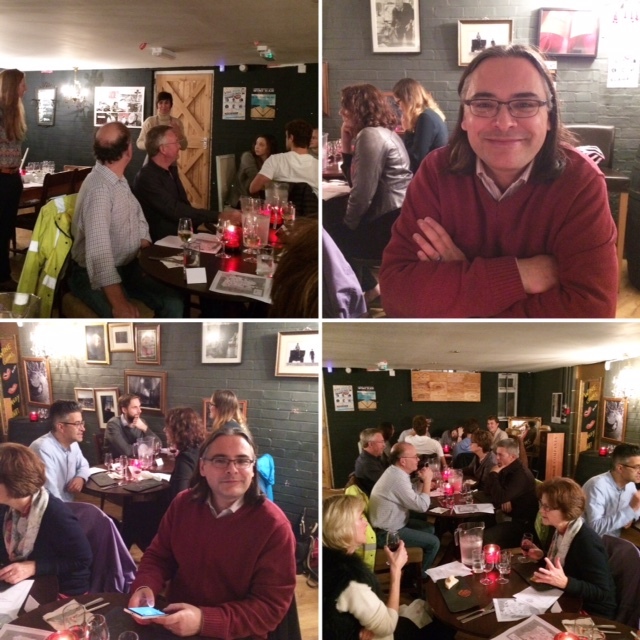 The event, held in Cambridge Wine Merchants’ cosy wine bar at the back of the Cherry Hinton shop, featured five tapas and five wines. 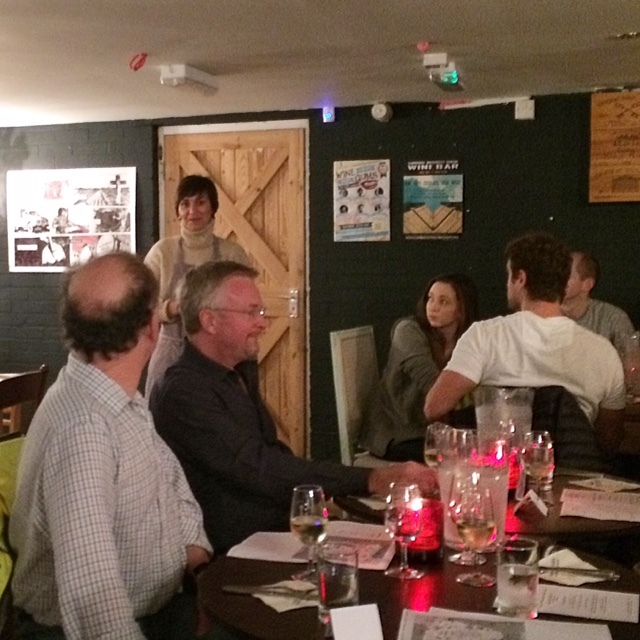 To kick things off, Estefanía addressed the group and ran through the menu. It all sounded so delicious! I couldn’t wait to see what the dishes would actually look like, based on her description of ingredients and flavours. 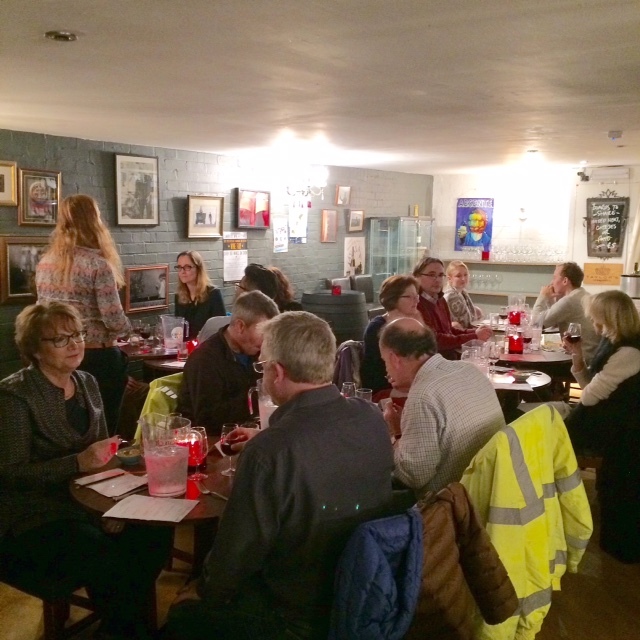 The wine tasting was led by Cambridge Wine Merchant’s wine expert Alice Archer. 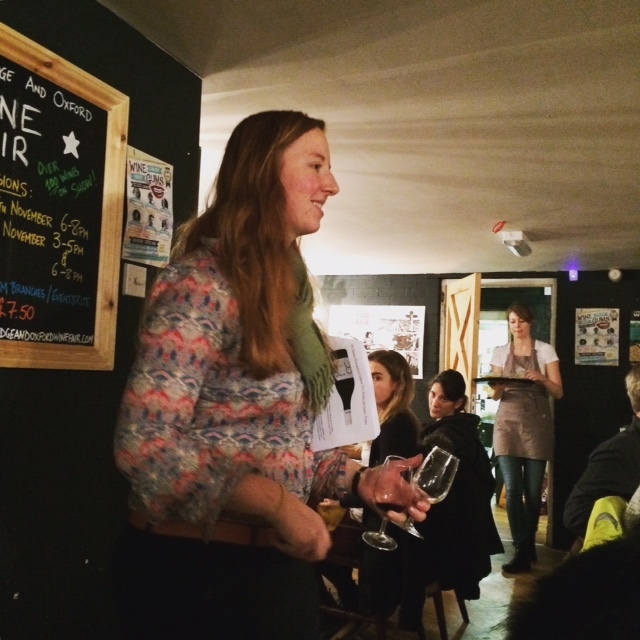 She took us through the tasting notes of each wine with a brief explanation of the wine producing areas. She even gave us a map of Spain to show us where Castilla-León is located. The talk was light-hearted and informative. We weren’t bogged down with excessive details and had the opportunity to talk amongst ourselves between tastings. The first wine we were served had no food pairing. That’s because there wasn’t a sweet wine to match dessert, the last course. This still kept the total of wines to five. The Beronia Verdejo 2015 (Rueda) was a light, zesty and refreshing white… a great aperitif to start off the evening. It was easily (and dangerously) quaffable! 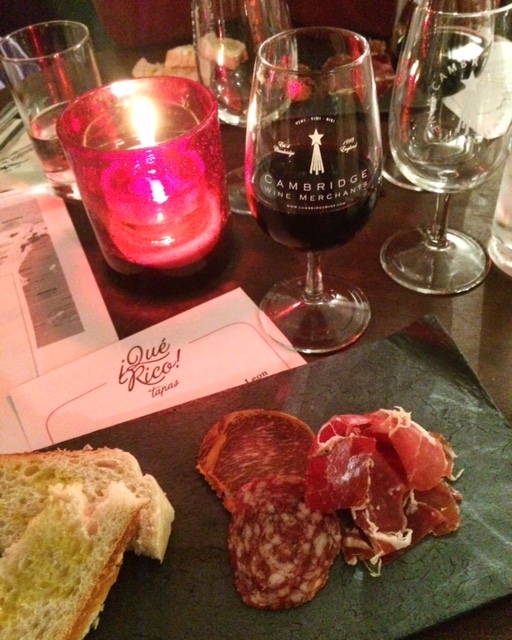 The jamón was paired with a slightly chilled red, Bioca Mencia 2015 (Bierzo). A real “summer red”, it was young, fresh, bright and zippy! 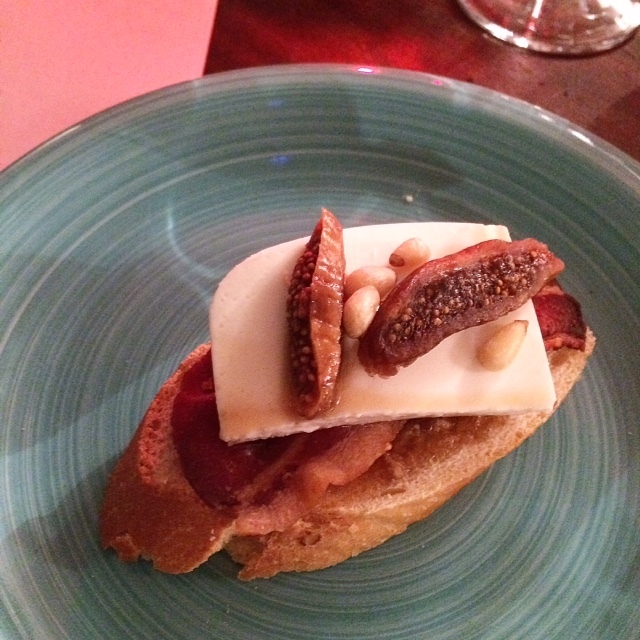 The second course was inspired, featuring a layer of jam made with Pedro Ximénez on a slice of fresh bread, topped with bacon, Burgos cheese, figs and pine nuts. The milky flavour of the cheese complemented the sweetness of the figs and the saltiness of the bacon. Gorgeous layers of textures. I absolutely loved this culinary creation. 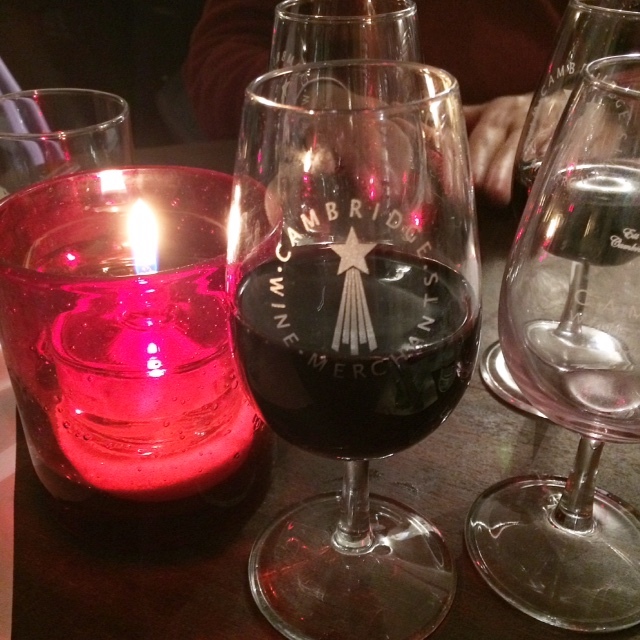 Another excellent red, Dominio de Cair Cuvée de Cair 2014 (Ribera del Duero), was paired with the cheese. Made with 85% Tempranillo, the king of Spanish grape varieties, it was full bodied, floral and brambly. The next red we sampled also came from Ribera del Duero, in competition with Rioja for Spain’s greatest wine region. De Bardos Romántica Crianza 2012 was smooth with a creamy texture and vanilla aroma. I could have happily eaten a big bowl of the cannellini beans with salted cod, the third course. 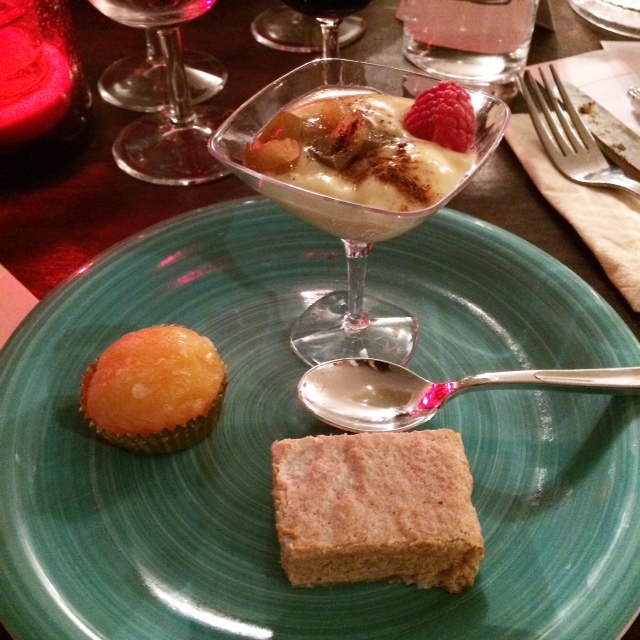 It was rich, creamy and full of flavour… a nice match with the Romántica Crianza. I’m not a huge fan of salted cod but in this dish it wasn’t a main ingredient. It was more of a condiment with its intense salty taste. 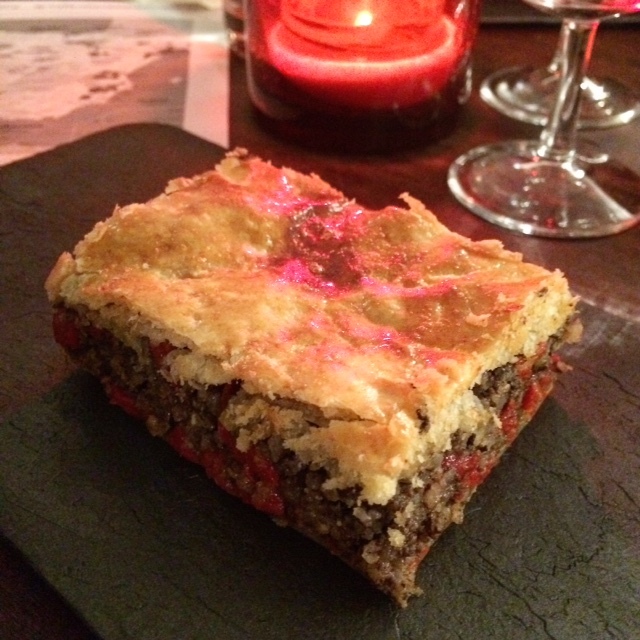 The fourth course featured layers of morcilla de Burgos (Spanish black pudding) and piquillo peppers, to make up a type of pie with a top crust. 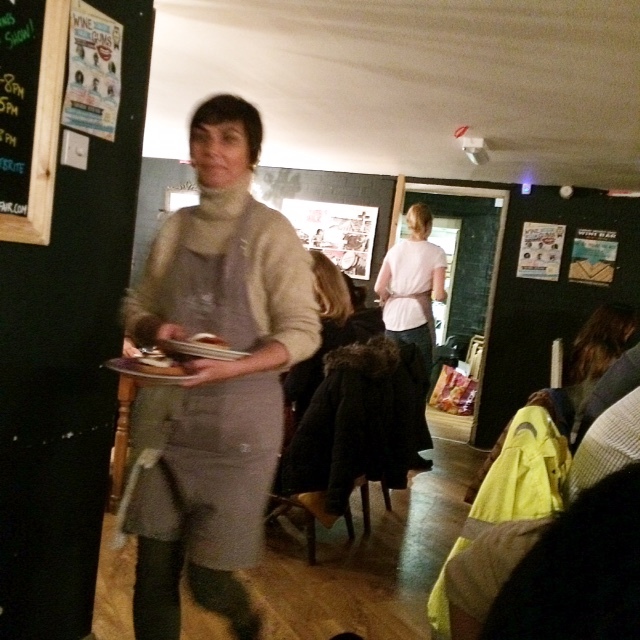 Estefanía had mentioned at the beginning that Spanish black pudding is different to what we’re used to here. It is milder and contains rice. The whole pie was full of flavours and textures that just melted in my mouth, with the spicy peppers providing a slight hit at the back of the throat. 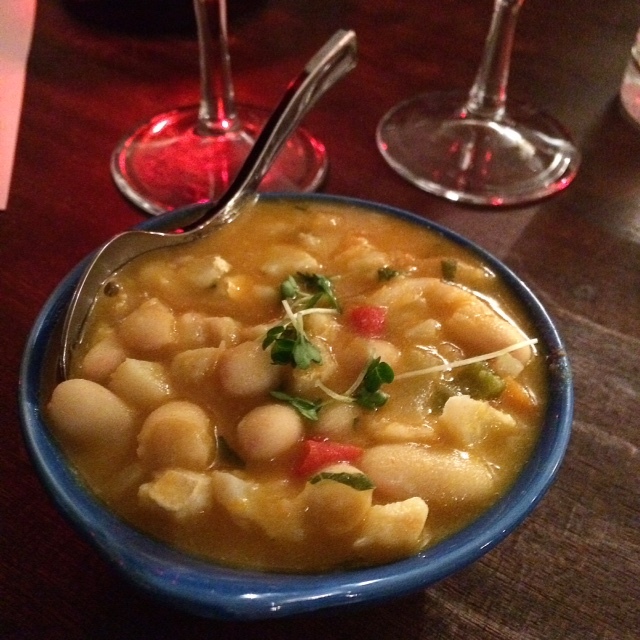 Kudos to Estefanía for creating this wonderful Spanish comfort food! The last red wine was Gil Luna Sin Complejos Tinto Ecológico 2014 (Toro). Hints of grapes and forest fruits with just a touch of spice made this a popular wine. However, the label on the bottle got a lot of attention too. “Sin complejos” means “no hang ups”… google the name of the wine and have a look at the label. Fabulous! The desserts in the last course were a real treat. We were served two regional specialities: Yemas de Santa Teresa (from Ávila), which are candied egg yolks made into a rich and creamy ball, and natillas, a rum flavoured custard topped with pear, raspberry and cinnamon. However, there was a third surprise from another region (Aragón). 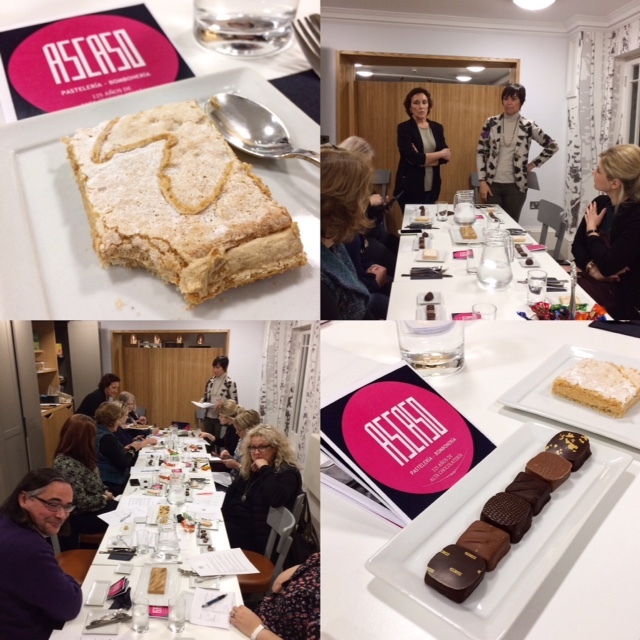 The attendees didn’t know they were some of the first people in the UK to taste Pastelería Ascaso’s pastel ruso, a sweet and incredibly light pastry with almonds, hazelnuts, praline mousse, egg whites… and a secret ingredient! I was privileged to be a part of a foodie tasting group the week before, organised by Estefanía at the Regent Hotel, where we tried pastel ruso as well as other Ascaso delights. All I can say is… watch this space. Cambridge is ready for this deliciousness! Throughout the meal, Estefanía and her team kept the dishes flowing at a good pace, with enough time for us to savour our wines whilst still managing to serve the next courses at the right temperature. This may seem effortless but coming from a family of restaurateurs, I know how difficult it is to coordinate everything. The area at the back of Cambridge Wine Merchants had a nice, cosy ambience with its mismatched tables and chairs and subdued lighting. It was the perfect place to hold an event like this, one that can offer such inventive and delightful food with a variety of excellent Spanish wines. I can’t wait for the next one! Keep an eye on Qué Rico Tapas’ Facebook and Twitter. 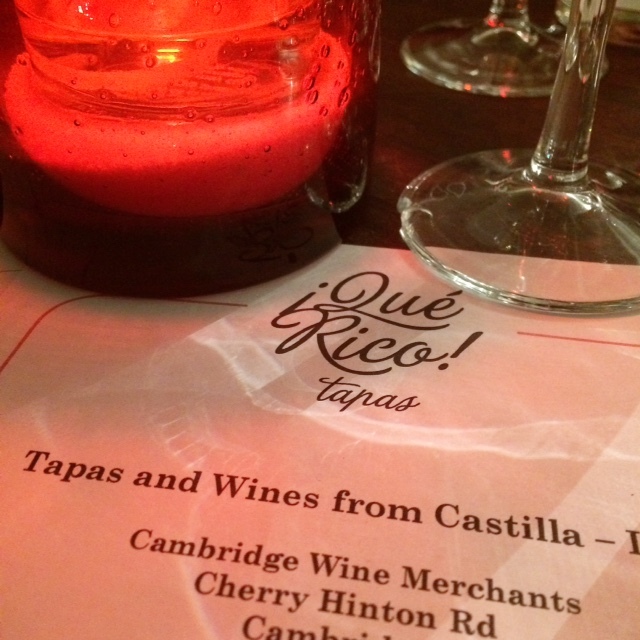 Qué Rico Tapas and Cambridge Wine Merchants were unaware that my experience would be the basis of a written review. It is based on my experience at my own cost and I did not receive compensation for my review. This entry was posted in Food Events and tagged Burgos cheese, Cambridge Wine Merchants, Castilla-Leon, Cherry Hinton, Estefania Led Ramos, Jamon de Guijuelo, morcilla de burgos, natillas, pastel ruso, Pasteleria Ascaso, piquillo peppers, Que Rico Tapas, salted cod, tapas, Yemas de Santa Teresa by One Two Culinary Stew. Bookmark the permalink.